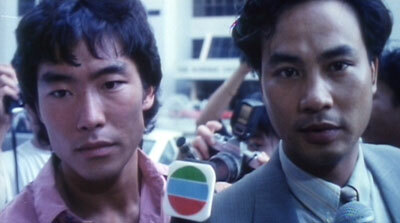 Hey, he had a mean and naughty streak too, Mr. David Lam! In between mature works like Goodbye Mammie came the punishing hostess melodrama Girls Without Tomorrow (aka Call Girl '88) and the entertainingly violent Women's Prison so why not turn to the gigolo movie starring the man easily picked for such a part, Mr. Simon Yam. Although signaling very late his intent for Hong Kong Gigolo, it has also signaled a huge risk to take with this episodic tale. It attempts substance, heartache and harsh violence but when all spices are spread over this Category III exploitation trash (in the good sense), it becomes more favourable when merely looking at it AS exploitation. It has its huge positives and drawbacks that. In quite amusing fashion, it seems David Lam is almost setting out to lure in the female audience first and foremost as the trio of males (well two of the more fit ones) work out, look oily and shower in the moody cinematography. Alex Man is not part of this equation and even comes off as the slimey one out of the trio when he picks up a French girl near the beginning. Neatly turning the tables later and getting the most dramatic value out of Man's story, you still have to remember that being scattershot with the plot also means putting logic on the line. That's why some initial sexual encounters that have to do with tragedy also is played out with a sense of goofiness. David Lam did not lace up his skates before going onto this slippery ice but it's fun watching him do all manner of crazy, very noticeable stuff. We learn by the end of the movie that being a gigolo pretty much spells doom for your life. Keeping it a secret and being demanded to marry, form a family and have money, the trio try and keep their dignity as humans as best they can which is a valid, morally correct argument to have hovering over the film. Not easy though when people literally bring in God and your soul into the argument against the profession. Wrong angle. Mentioning this content every now and again matches the feeling one get from Lam's direction. It's serious intentions mixed up with fairly well done erotica, exaggerated acting (Western cast member Robert Middleton is noticeable to say the least), exploitation worthy of the III rating and gory melodrama allowed to be that since Lam IS playing with the rating. The best bits from this slightly random behaviour comes via Alex Man's performance. In no way subtle but very well handled, Lam brings up notions of Horse being the mentor who's lost it and is picked up by his students. Frustration, patience and reconciliation between him and Simon Yam's David who's the saint in the trio... when this story is allowed to breathe, we get a sense of warmth and hope present in the picture. It's unfortunately smothered in the story but it's enough of an emotional anchor for us to be invested. That investment coupled with harsh violence, events and tragedy that like karma come flying in at the trio of characters at the same time, it makes Hong Kong Gigolo watchable when taping together the scattered elements that work. A cohesive whole you won't be able to make out of it but David Lam does enough right as an actual filmmaker in combination with over the top Category III, DARK shenanigans. It's actually a quickly digested but in general well seasoned product. Subtitles: Imbedded English and traditional Chinese. Extras: Trailers for the David Lam productions First Shot, Gigolo And Whore and a fairly meaty Stars' File on Simon Yam.